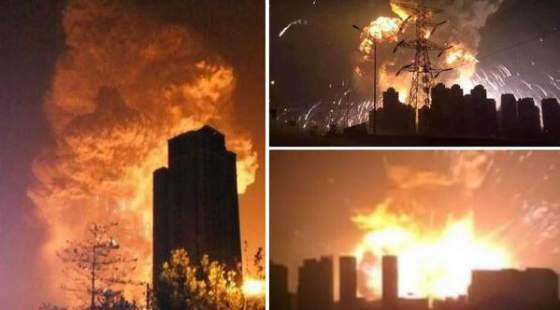 Videos and Photos: Massive explosion in Tianjin, China - Balita Boss! The massive explosion in the city of Tianjin, China on Wednesday (August 12) night that killed at least 50 people and injured hundreds. The first explosion happened at about 23:30 on Wednesday was followed by another, more powerful blast, seconds later. Shockwaves were felt several kilometers away and it registered as an earthquake, CNN reported. Below is the possible caused of explosion, according to Reuters report. Here's some of the videos and pictures shared by news agency and people who witnessed the explosion, that show complete destruction of the area. Massive explosion in Tianjin China. We were on the top of a 33 story building watching the shooting stars, but we witnessed the whole explosion. So we had to run down the whole 33 levels and escape. Posted by Daniel Van Duren.